Holiday Gift Guide for the Food Lover: Cookbooks! I know that if you are on this food page and that if you are anything like I am, then you have at least one loved one, one friend who would love nothing more for Hanukkah or Christmas than a really great cookbook or two. And admit it, you have a cookbook or two on your own list every year, as well, the list you leave for others (or Santa) to find, don't you? Woman unpacking present, close up. Thanksgiving is over and our eyes are now steadfastly turned towards Hanukkah and Christmas. We've started our holiday lists, noting ideas next to each name in search of the perfect gift(s) for our family and friends. But the choices out there are so numerous as to be mindboggling! What will be appreciated, loved, and used? How to determine what is truly excellent and not simply trendy? Choosing gifts, choosing the perfect cookbook, can be frustrating and maddening. And so, once again, I have searched for and selected a wonderful collection of cookbooks for you to offer to the cooks, the bakers, the food lovers on your gift list. Each book on this list is written by an expert, some professional chefs and cooking teachers, some excellent home cooks, each book on this list is uncomplicated and inspiring, a joy to sit over and read and a delight to cook or bake from time and time again. Something for each and every food lover on your gift list. Don't forget to check out my cookbook gift guides for 2013 and 2014 - these great cookbooks and food-inspired books are still as tempting, excellent, and loved as when they first came out. Southern Soups & Stews is food writer and cooking teacher (and Southerner!) Nancie McDermott's 11th cookbook. 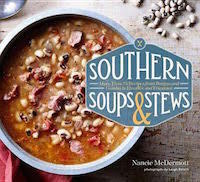 After Southern Pies and Southern Cakes, Nancie has tackled another specialty of the great South, soups and stews and this might be her most exciting, acclaimed cookbook yet! Nancie traveled across the Southern states interviewing and cooking with home cooks and chefs and has gathered more than 75 time-honored recipes for Gumbo, Burgoo, Etouffée, Fricassee, Bog, Chicken and Dumplings, Seafood Muddle, She-Crab Soup and Brunswick Stew - are you hungry yet? This fabulous cookbook offers an amazing collection of hearty soups and satisfying stews seasoned with history and spiced with stories, the perfect gift for someone who loves gathering family and friends together in a warm kitchen and nourishing them body and soul. (And what better to end the feast than with an old-time Southern cake from Nancie's Southern Cakes?) Visit Nancie's website and blog here. Maria's first cookbook, the award-winning Ancient Grains for Modern Meals, put her squarely on the map as the go-to expert on ancient grains. Maria, long passionate about ancient grains and thrilled with the recent revival and newfound popularity of traditional grains, has made cooking and baking with these delicious, healthy, satisfying kitchen staples both simple and accessible. 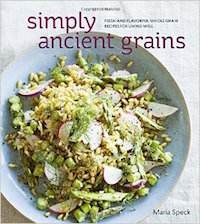 In this, her second cookbook, Simply Ancient Grains, Maria takes you by the hand and shows you how cooking grains everyday is possible. Simply Ancient Grains begins with an A to Z of ancient grains, giving the history of each, explaining texture, flavor, and nutrition, followed by careful and well-explained section on cooking method, and finally how to bake with ancient grains. But the recipes! Oh the recipes! Delicious, luxurious, satisfying, comforting! Maria's own background - she is half Greek, half German - influence the flavors of the beautiful dishes that fill the pages of this beautiful cookbook. Sweet potato and oat cakes with blue cheese and sage, quinoa bites with smoked salmon and dill, honeyed spelt cornbread with fresh and dried cranberries, and lemony millet pudding with caramelized grapes or dark chocolate cherry cake with marsala cream will have you cooking ancient grains with passion! The best gift for the home cook who thinks fresh, delicious, healthy, everyday. Many are gluten free, too! Visit Maria's blog here! The Comprehensive, Must-Have Resource for Today's Baker from former pastry chef and award-winning baking expert Abby Dodge. I must admit that as a passionate home baker I am a huge fan of Abby Dodge's. Desserts 4 Today, Mini Treats & Hand-Held Treats, and (especially) The Weekend Baker, her baking books are fun, easy-to-follow (filled with tips, expert advice, and suggested variations), and her desserts are always fabulous and oh-so good! I have been waiting for her newest, most comprehensive baking book to come out (mine is ordered and on its way!) and here it is, just in time for the holidays! 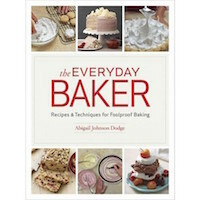 The Everyday Baker includes over 176 foolproof, innovative recipes for both sweet and savory baking, all featuring must-know tips and techniques, comprehensive instructions, and more than 1,000 step-by-step photograph instructions to help you along and make baking everyday easy, fun, and delicious! Breads, cookies and cakes, breakfast, lunch, and brunch baking, simple snacks to elegant desserts and holiday baking... Abby and The Everyday Baker have you covered. For the baker - the novice, the wanna-be, the passionate, the expert - on your gift list. And buy an extra copy for yourself. Visit Abbey's website here. Chef Anthony Lamas, Food Network's "Extreme Chef" winner and multiple James Beard Best Chef nominee... and chef/restaurateur has teamed up with James Beard nominated blogger and culinary travel writer Gwen Pratesi to write the stunning, mouthwatering cookbook Southern Heat, New Southern Cooking Latin Style. 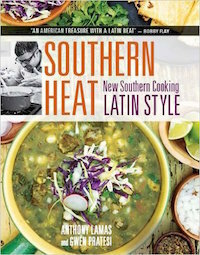 Southern Heat is filled with recipes for the same delectable dishes Chef Lamas serves up in his Louisville, Kentucky restaurant Seviche where his Latin roots are blended with the best ingredients of the South to create his own interpretation of Southern food. Lamas' "Modern Latin" cuisine is an exciting mix of traditional recipes and bolder, more daring dishes, from a gorgeous Posole Verde to Macadamia-Crusted Sea Bass with Passion Fruit-Habanero Sauce, from Kentuckey Heirloom Tomato Gazpacho to Roasted Sweet Potatoes with Sorghum and Chipotle-Pecan Butter, from Mamaw's Peach Cobbler to Flourless Chocolate Cake with Kahlùa Ganache. For an exciting, exotic cuisine, the recipes are well written and organized and simple to follow, making this a thoroughly accessible cookbook for any adventurous cook on your list! Visit Chef Lamas' website here. Visit Gwen's beautiful website Bunkycooks here. Think Paris and think pastries. Following her wildly popular Mad About Macarons, Jill Colonna's Teatime in Paris walks you through a superb collection of easy French pastry recipes letting you recreate the best éclairs, financiers, millefeuilles, crêpes, tarts and tartlettes, macarons, and other delightful patisseries in a wide variety of flavors so you, too, can enjoy your own classic French treats at teatime - or anytime - in your own home. My favorites? Chocolate, Cinnamon, Chestnut Macarons, Wild Blackberry Millefeuille with Spiced Blackberry Pastry Cream, Passionfruit and Lemon Meringue Tartlets, and the chocolate chip Mini Tigrés. Teatime in Paris is chock full of tips, advice, references guides, clear step-by-step instructions, and on-line stockists. 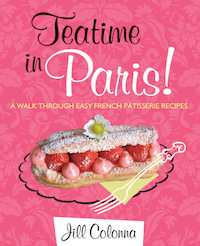 For anyone who loves Paris, loves French, loves pastries, this pretty pink book is just the treat! Visit Jill's blog here. Tara is a fellow food blogger with a kitchen much like my own; having grown up in a multicultural kitchen, she finds inspiration and influence across cultures and countries, is comfortable pushing culinary boundaries while creating heart-warming, homey, family-style dishes and meals. 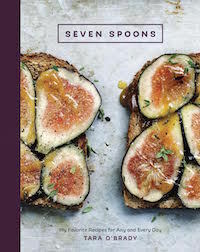 Seven Spoons - also the name of her popular blog - is a beautiful cookbook filled with everyday dishes for every level cooking experience and every palate. Clearly written and organized, simply divided into meals and courses, Tara shares her family's favorite recipes for such delights as Blackberry Buttermilk Whole Grain Scones, Roasted Carrots with Dukkah and Harissa Mayonnaise, Feel-Better Curried Soup with Crispy Chicken, and Blood Orange Stout Cake. A wonderful cookbook for a friend who loves to cook but looks for new inspiration every day, who wants to prepare good meals for his or her family but isn't afraid to mix homey comfort with something a bit more exotic. Wholesome, hearty, fresh, seasonal, ingredient-driven dishes. I live in France and nothing pleases and excites me more than sitting down to a traditional French meal, discovering traditional French dishes and the history behind each. Françoise Branget, a member of the French National Assembly, set out to preserve and share some of the country's best loved recipes and asked each of her colleagues to contribute one recipe from the region that he or she represents. 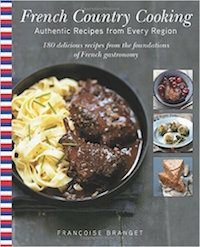 French Country Cooking is this magnificent collection of recipes, dishes made in home kitchens and farm kitchens following the rich traditions of France's culinary heritage. Monkfish in Normandy Sauce with Apple Wine, Pike in Beurre Blanc and Vouvray, Burgundy Coq au Vin, Bresse Chicken in Creamy "Mère Blanc" Sauce, Ceviche of Tuna with Lemongrass, this stunning cookbook is an homage to French cuisine, a truly nationwide portrait of authentic French cuisine, but it is also a cookbook any food lover, any Francophile will turn to again and again. I think I always have one of Domenica Marchetti's cookbooks on my holiday lists because I love her food and her cookbooks so much. Former journalist turned cookbook author and food writer, Domenica has become the go-to expert for all things Abruzzo and incredible, authentic and accessible Italian food for every day. 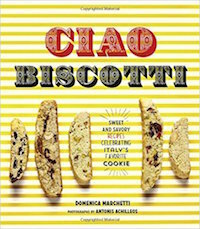 Ciao Biscottti is her sixth cookbook, dedicated to the wonderful Italian biscotti or twice-baked cookie. Domenica has created 44 authentic biscotti recipes, both sweet and savory, both traditional and more surprising flavors: Browned Butter Toblerone, Christmas Pistachio and Orange, Chocolate Chunk and Cherry, Almond and Aged Asiago, Crispy Pancetta, Mountain Gorgonzola and Walnut... biscotti are the best snack, perfect for dunking into coffee, tea, or Vin Santo, for your holiday cooking tray, or even -with Domenica's astonishing savory versions - as a delicious, surprising cocktail or party hors d'oeuvre. A great little stocking stuffer for your favorite Italophile, baker, or cookie monster. Visit Domenica's blog for more Italian recipes here. Ah, side dishes. I never have trouble thinking up the main course and deciding on dessert is my passion. But the side dishes? What do I serve with this? has befuddled more than one cook. You, too? Don't we often just end up preparing and serving the same choices over and over again? Or we turn to any cookbook's often-meager chapter on sides for inspiration. 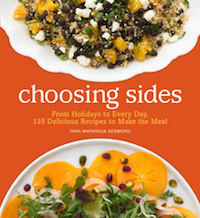 So thank heavens for Tara Mataraza Desmond for gathering together 130 mouthwatering side dish recipes in one cookbook! Your plain mashed potatoes, although comforting and good, will pale in comparison to Tara's Smoked Gouda Grits, Chorizo Chard, or Blood Orange Wild Rice. Or her Persimmon, Pomegranate, and Pistachio Salad, Coconut Cilantro Toasted Israeli Couscous, Pumpkin Cozy Rolls, Honey Balsamic Peaches and Burrata, or Sesame Braised Bok Choy. Tara offers a fantastic selection of side dishes for every occasion - comforting and homey to spectacular, family meals to intimate gatherings to special events and holiday feasts, side dishes for breakfast, brunch, and lunch, cookouts and weeknight dinners. Now all you have to do is Choose Sides. Prolific food writer and cookbook author Monica Bhide offers a luxurious collection of her personal essays all about food. Each beautifully written essay explores a facet of her own - and in extension our - relationship with food, the romance and passion, the curiosity and exploration, the successes and failures, the heartbreak and guilt, the happiness and pure contentment. 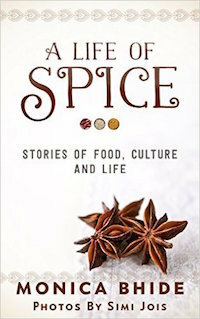 As sensual as the food that she writes about, Monica's stories on food, culture, and life will have you thinking, examining, celebrating our connection to food and the intimate role it plays in each of our lives. Funny, heartwarming, emotional, each thought-provoking essay is a delight, the whole a delicious collection of excerpts from the writer's own life as eater, cook, culinary explorer, and writer, offering the reader a voyage through the moments of a lifetime defined by food. Visit Monica's blog here. The search for the New Mrs Eaden, 1960s cookery writer and housewife extraordinaire, is on and five enthuasiastic amatuer bakers from five very different walks of life have been selected to compete for this life-changing honor. 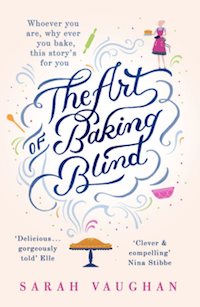 Of course, in a book like The Art of Baking Blind, nothing is ever that simple. As the competition ensues, as the cookies and cakes, the puddings and breads get whipped up and pushed into ovens, the personalities, the personal stories, the problems facing each contestant - and Mrs. Eaden herself - are revealed and the competition almost takes a backseat to the personal turmoil each contestant is going through... even as you are cheering them on in their baking. Auther Sarah Vaughan is a former Guardian journalist, news reporter and political correspondent, who always wanted to write fiction and her first novel, The Art of Baking Blind, is a wonderfully written, can't-put-down, engaging story that had me rooting for each contestant and wanting to get in the kitchen to bake at the same time. Chick lit? Maybe. Food lit? Yep. But the best in each category, a fun, compelling novel that I didn't want to end. Addictive! Visit Sarah's website here. A wonderful, entertaining, heartfelt novel by award-winning cookbook author Judith Fertig. 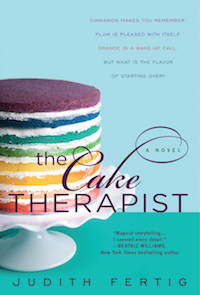 Claire "Neely" O'Neil ends a marriage and opens a bakery in her home town, putting into play her talents as a baker and her special gift of "tasting" people's feelings and histories, the better to create their perfect cake and help them find answers to their personal problems. A simple and enjoyable read, the only negative being that I found myself asking "but what is going to happen next?" at the end of the book... but rumor has it that there is a sequel on the way! A warm, intriguing novel laced with mouthwatering descriptions of cakes, another great stocking stuffer for the friend who loves to read while sipping a cup of tea and enjoying a thick slice of cake. Visit Judith's website and blog here. Jamie Schler lives, eats, and writes in Chinon, France where she owns a hotel. To read more of her work visit Life's a Feast.